No these babies aren’t for a CFL fantasy league. 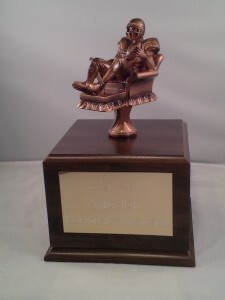 This Ultimate Fantasy Football Trophy is heading to Canada! We get a lot of Canadian customers who watch the NFL and play fantasy football. A few years ago, I spoke with some marketing people from the CFL about doing a co-marketing agreement for Canadian Fantasy Football. What I didn’t realize was that there aren’t enough teams in the CFL to make a decent fantasy league. With only eight teams, you could only have a maximum of eight players in a fantasy league. Imagine the pressure in that draft! By the way, I caught part of the CFL game last night on NBCSC. The Calgary Stampeders vs. The Saskatchewan Roughriders. I do the same thing every year. Staving for football, I stumble upon a CFL game mid-August and enjoy it for awhile but the rules are so different I keep looking for a penalty flag on every play. By the way, what ever happened to the second Rough Rider team in the CFL? Yes, the CFL had two teams with the Roughrider nickname. One as one word, “Roughriders” and one as two words, “Rough Riders“. Go Red Blacks! My new favorite CFL team…starting in 2014.